Yup, it’s “Flame of Inspiration,” the guild’s 2016 QuiltCon Charity Quilt. A modern interpretation of a traditional lone star quilt, it was shown at QuiltCon in Pasadena, but then has hung out at home for a bit while a recipient was arranged. 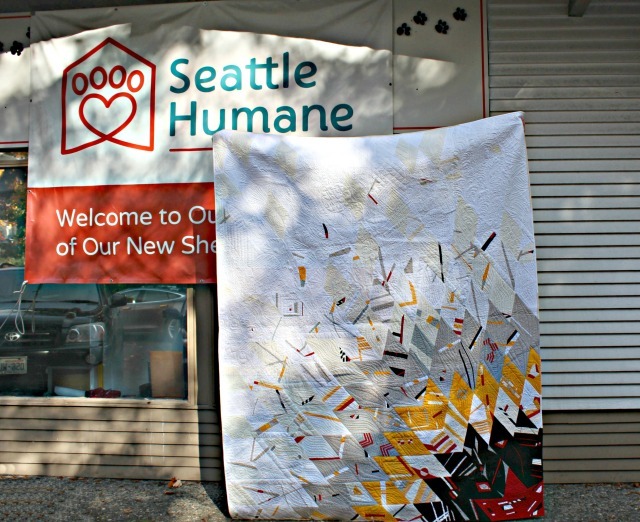 Well we’re happy to report that the quilt has been delivered to Seattle Humane, where it will be auctioned off in their 2017 fundraising gala, ‘Tuxes & Tails,’ next spring.